Soul Wars is an Activity similar to Castle Wars, where it is located in Edgeville only on member worlds. However it's designated worlds are 44, 143 and 145. 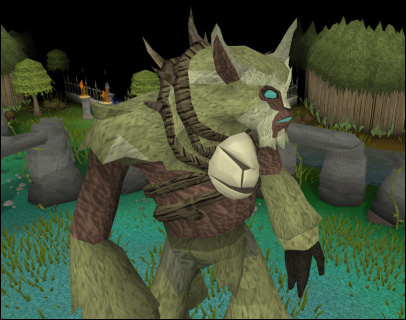 Just like other Activities, there are, of course, rewards you can win, ranging from experience for all of your combat skills (excluding Summoning) to having one of your slaughtered creatures from Slayer to become a familiar to gambling and winning up to 100,000gp! Although there aren't any skills requirements, having a high Slayer and combat levels are recommend. This is a safe game, so you will not lose your items upon death. Because Soul Wars is a Safe Activity, feel free to bring the best items you can afford. The following are recommendations for equipment setups. 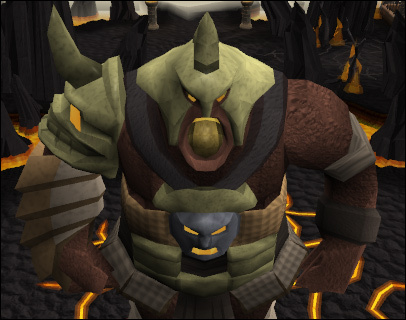 Helmet: Dragon, Barrows, Helm of Neitiznot, Third Age. Torso: Runite and above, Barrows, Bandos, Third Age etc. Legs: Runite and above, Barrows, Bandos, Third Age etc. Shield: Rune Kiteshield, Dragon Sq. Shield, Obsidian Shield, God Book or Third Age. Boots: Dragon, Bandos, Boots of lightness etc. Helmet: Ahrims, Infinity, Lunar, Mystic Robes etc. 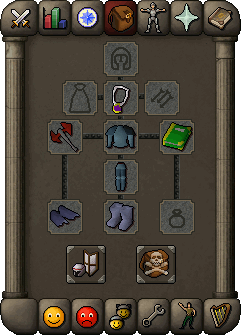 Torso: Ahrims, Infinity, Lunar, Mystic Robes etc. Legs: Ahrims, Infinity, Lunar, Mystic Robes etc. Boots: Infinity, Lunar, Mystic Robes etc. 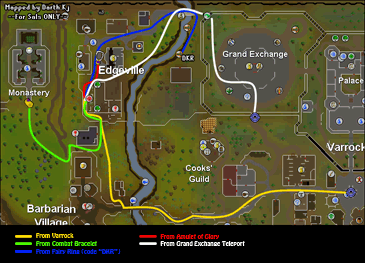 Walk from Varrock to Edgeville. 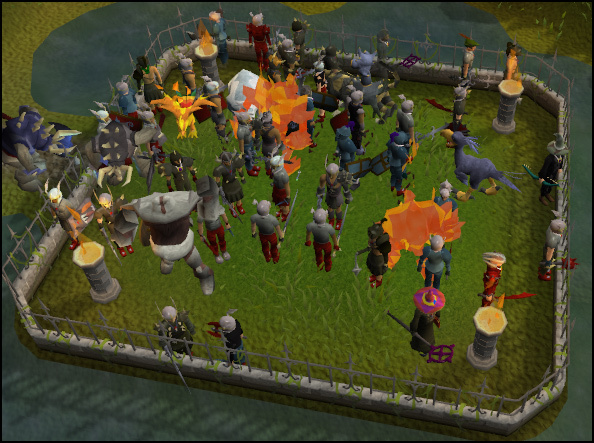 Teleport to the Prayer Guild and walk to Edgeville. 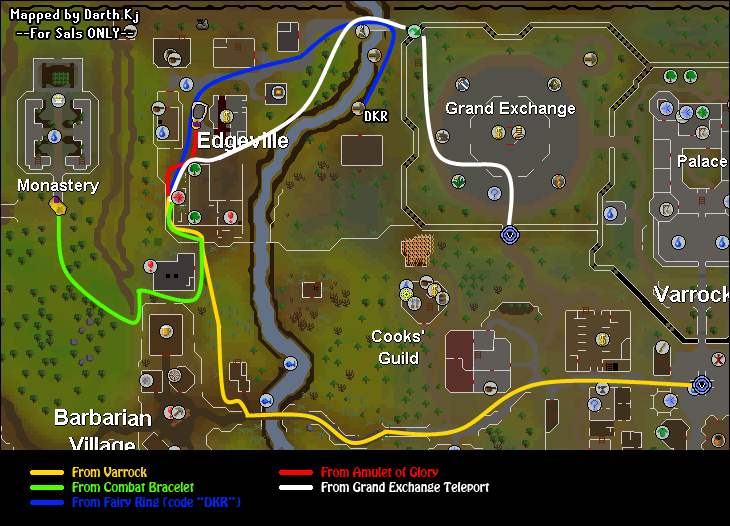 Teleport via Fairy Ring code "DKR" and walk to Edgeville. Teleport to Edgeville using an Amulet of Glory. The choice to do the 5 minute tutorial (recommended). Read a book explaining how to play. Choose whichever one you like. Once you have done the tutorial or read the book, head South past the graveyards. Head west to join the Blue Team, head east to join the red team. Over time you will receive a higher-priority to enter the game. When a new game starts, Players will be chosen based on Priority. Those with a higher priority will enter first while those with a lower priority will enter later. While you are waiting for the game to start, an information box will be in the top-right corner stating how many players are needed on each team for the game to start, and how long until the game begins. Once the timer reaches zero, the game will start! 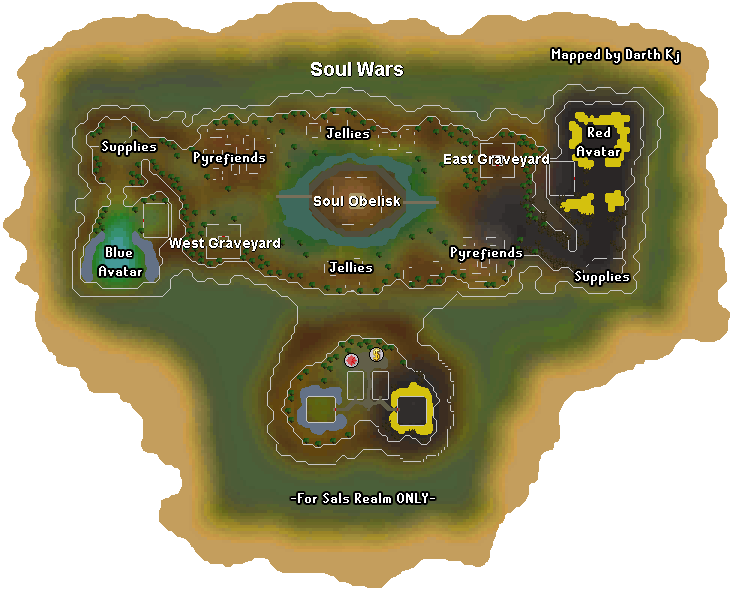 If you have had enough of Soul Wars, feel free to leave via the portal behind you. To aid your allies in the battle, step through the forcefield. Defend your avatar by fighting off attackers on the opposite team. Help take over the Soul Obelisk/Fight the enemies Avatar. Fight Jellies or Pyrefiends on the outskirts of the battlefield to collect Soul Fragments/Bones. 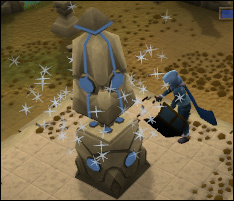 Your main objective is to use the Soul Obelisk to lower your enemies' Avatar slayer level so you or your teammates can attack the avatar. You can lower it by using Soul Fragments you find when you kill Jellies, Pyrefiends or enemy players with the Soul Obelisk. However, to do that, you need to make sure your team has more players standing around the obelisk then the enemy team does. Then you will start to take over the Soul Obelisk. You can also kill Pyrefiends (Level 30 Slayer required) or Jellies (Level 52 Slayer required) to collect bones and bury them in one of your graveyards to help boost your avatars slayer level again. The three icons represent which teams control which section. In this image, Blue are in control of the West Graveyard and Soul obelisk. Red are only in control of the East Graveyard. Under the Soul Obelisk icon is a colored bar (Blue in this case) this will only appear when you are near the Soul Obelisk and attempting to take over. Once it turns to the opposite color (Red in this case), the other team will take control of the Obelisk. On the right is a Green Bar, if this gets down to Orange/Red, You will be kicked soon for not participating in the game. You can get this back up again by attacking enemies, using Soul Fragments on the Soul Obelisk etc. Avatar Deaths indicate how many times your avatar has died. You want to keep this as low as possible! The team with the lowest amount will win the game. 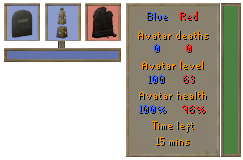 Avatar level indicates the Slayer level required to kill that teams avatar. 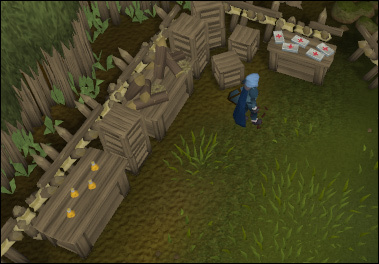 In this image, you only need 63 Slayer to attempt to attack the enemy's avatar. Avatar health indicates how much health your avatar has left. If its beginning to get low, you might want to go help out your avatar! Time left states the approximate time until the game is over. On the East and west sides of the battlefield are supplies which you can use to your advantage. Finally, Explosive Potions are a quick way of destroying a barricade in one hit. If you happen to die during the Activities, you will respawn in the nearest graveyard your team controls. If you choose to leave a game, you can leave via the portal in the graveyard next to your avatar. Warning: If you leave a game, you are unable to join another game until that game is over. This is to stop cheaters swapping over to the winning side. The only way to win the game is by killing the enemy avatar as many times as you can. But it won't be easy, they're a whopping level 525! Now, you have to got to take the dangerous path of getting past the enemy. Toggle Run and run past your enemies ignoring them until you reach the enemies avatar. Along the way you may need to destroy a few barricades. Once you reach the avatar, get ready for a fierce fight against it. It is highly recommended to have a familiar out so they can attack enemy players who are attacking you as familiars are unable to harm the enemy avatar. Protect from Melee is extremely recommended. If you can, use Enchanted Ruby bolts as they can hit 150+! However, you can also use a Godsword against the avatar if you prefer melee. It is also recommended to be level 115+ as you will be defending yourself against a level 525 and other players. It's dangerous, but you will reap the rewards if you kill the Avatar! Try setting up a "border" just in front of your supply base. Simply set up a few barricades just outside the supply base so it creates a "border". Have a few rangers/mages waiting behind the barricades so when an Enemy comes into range, they are ambushed. Never head into battle without bandages and explosive potions. These can be your best friends during the battle! Need some Supplies? Try stealing some from the enemy base if you are running past, just be careful of the enemies that will attack you. You can view the available rewards by talking to Nomad. All rewards are purchased using Zeal, which you receive whenever you participate in a Soul Wars game. The amount of experience earned per Zeal Point depends on your level in the selected skill. If you have slaughtered a certain Slayer monster in the past (a Zombie Hand for example), you are able to take it to Nomad, and get it turned into a Summoning pet as long as you have the required amount of Zeal.